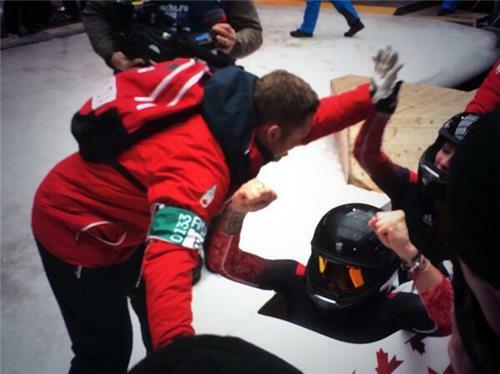 Follow along and engage with our behind-the-scenes coverage of the Canadian Figure Skating events at the Sochi 2014 Olympic Winter Games. Weinzierl scores 57.63, she moves into 3rd. A couple of beautiful red dresses in this group from Akiko Suzuki and Gracie Gold. Victoria Helgesson from SWE up first. Helgesson scores 47.84, she is currently in 16th place. 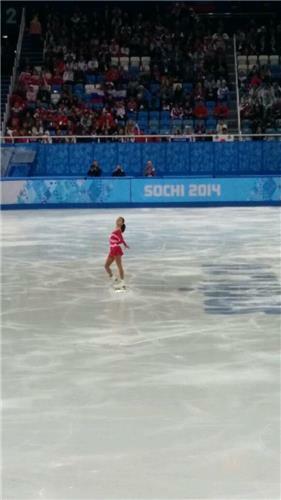 Time for the Japanese fans to show what they've got... Kanako Murakami on the ice. Murakami up next, lots of Japanese fans in the audience! That's too bad about the popped flip, because I was really enjoying that program. I don't know that I've ever appreciated her speed before. Kanako looks like she's ready to cry. Marchei from ITA up next. 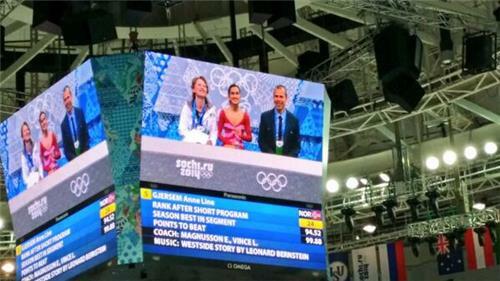 She laid down impressive long program in the team competition. Looking forward to seeing her short program. 57.55 for LI, she is currently in 5th place. Suzuki from Japan up next. struggled with the landing of the triple toe, doesnt add the combo on the end. recovers nicely with a triple flip, triple toe combo. I love Akiko and how her joy for skating always comes through. 60.97 for Suzuki, she is in 4th place. the ice is being resurfaced we'll be back shortly to bring you the final flight. The last flight is on the ice for warmup and with two Russians, including 15-year-old wonderkid Yulia Lipnitskaia out there, I'm wondering just what it would take for this roof to actually come off. The other home favourite Adelina Sotnitkova was just introduced and she is just as loved. This is a pretty stacked flight. Lipnitskaia will get us started. Mao Asada will close it out. In between we've got former world champion Carolina Kostner as well as Ashley Wagner who was named to the US team after a rough national championships but has been outstanding the last couple of seasons. And the chants of YULIA have begun! Huge gasp from the audience as she falls! First flight on the ice warming up! I love Anne Line's story. She qualified at Nebelhorn but the Norwegian Federation wasn't ready to send her and put a top 8 placement on her at Europeans. Before the event started, it was realized how difficult that would be in the Euros field so they changed the requirement to a good showing which she accomplished so here she is and made the LP after missing it at worlds last year. So Norway hasn't had an Olympic figure skater since 1964? That's what I see on sports-reference.com. And according to the INFO system we have, she lists Sonja Henie as one of her idols. 85.98 for Gjersem in the free skate to sit fifth overall. Nicole Rajicova, born in the US and trains there but her parents are Slovak so she decided to represent them to have more opportunities. When she made the switch she added the -ova to her surname. The next group has emerged from backstage ready to go on the ice for warmup, including Kaetlyn Osmond. Rajicova scores 75.20, giving her a total score of 125.00.